Uricase is not a gout treatment. 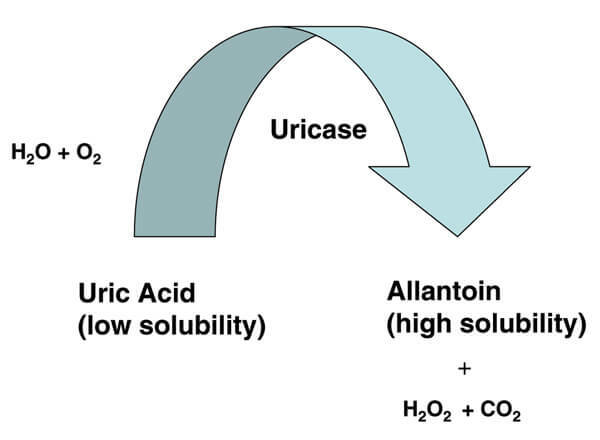 It is an enzyme that converts uric acid to allantoin. Allantoin is much more soluble than uric acid, and passes harmlessly from the body. Unfortunately, during evolution, humans have lost the ability to produce uricase (also called urate oxidase). Scientists will argue about the reasons for this. However, we can do nothing about the reasons, though we might be able to do something about the loss of uricase. Uricase is not totally lost to us. The bacteria that keep our digestive system working do produce uricase. However, it is not clear if this plays a part in removing uric acid from our bodies. Two-thirds of the uric acid is normally excreted through the kidney while one third gains entrance to the gut where it undergoes uricolysis. these results argue against the active participation of intestinal bacteria in uricolysis in man. Given the significance of one-third of uric acid excretion not passing through the kidneys, the term extra-renal excretion was introduced to gout studies. In recent years, researchers have discovered a genetic role in extra-renal excretion. Ichida and colleagues progress the identification of genetic involvement by suggesting a new way to classify gout, which could have a significant impact on future treatment. They argue that the traditional division of gout patients into over-producers and under-excreters of uric acid requires refinement. Under excreters remains valid, but they argue that over-producers should be renamed kidney-overload (or renal overload type to use their term). Kidney-overload would then have two subgroups: genuine overproduction; and extra-renal excretion impairment. This may seem like semantics, but it is important. because the cause of excess uric acid can help to determine the treatment. In this case, it could influence new treatments that encourage uric acid excretion through pathways other than the kidneys. CONCLUSION: MMT can promote diffussion of uric acid from blood vessel to intestine, prevent absorption of uric acid in intestinal tract and decrease uric acid level in the serum. Now, this has little to do with uricase, but it is relevant that it points to a genetic advantage indicating that we could forgo uricase because we developed other ways to excrete excess uric acid. Unfortunately, some people have a weakness with this. Montmorillonite is an untested potential remedy, but science has also developed ways to replace uricase. Uricase does not exist in humans, so scientists have had to prepare it from other sources. This led to the early discovery that most humans cannot tolerate uricase as a treatment. A great deal of time, effort, and money have been spent refining uricase into an acceptable treatment. There are currently two replacement uricase products available, though neither is without problems. Detailed pages for these uricase-based gout treatments are coming soon. If you want to be informed when they are available, please see my Gout Info Update Service. Although not directly uricase related, if you want to try the Montmorillonite treatment, you should discuss it with your doctor. Montmorillonite is widely available as Calcium Bentonite. If you cannot respond to allopurinol or Uloric (febuxostat), and probenecid is only suitable for under-excreters, then Krystexxa could be good for your gout. This is best administered by a rheumatologist with experience in this new gout treatment. Please note that this information about uricase is flagged for review. I am gathering more recent information at Improving Uricase Information. Please see that discussion for my latest information about uricase and gout. How will you get rid of excess uric acid? Title: Uricolysis in normal man. Author(s): WYNGAARDEN JB, STETTEN D Jr. Published: J Biol Chem. 1953 Jul;203(1):9-21. Title: Role of the intestinal tract in the elimination of uric acid. Author(s): Sorensen L B. Published: Arthritis Rheum. 8, 694–706 (1965). Title: The study of human intermediary purine metabolism and its regulation. Author(s): Seegmiller J E. Published: Proc R Soc Med. 1966 April; 59(4): 292–302. Title: Origin and extrarenal elimination of uric acid in man. Author(s): Sorensen LB, Levinson DJ. Published: Nephron. 1975;14(1):7-20.